Another interview with Regal Cinemas can be watched here. The brotherly dynamic is, naturally, a key part of the film, and Devine describes that dynamic as one that reflects reality. After playing an extended clip of their NSFW film, Efron, 28, asked the quorum of movie theater owners if they wanted to see more, to which DeVine, 32, replied, "Are we gonna get naked?" "If anyone is getting naked it's going to be Zac," Kendrick, 30, quipped. Efron played along, but didn't feel it was appropriate to strip down and show off his Baywatch-worthy abs. "No one is getting naked. No one is getting naked," he hilariously demanded. "I was talking about showing them an extra clip [of the movie]." Kendrick replied: "If you want to get naked, that's your call, that's your call." 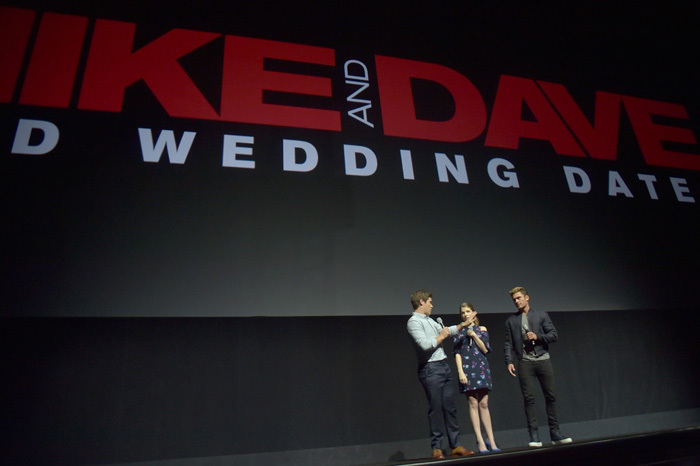 Mike and Dave Need Wedding Dates, the upcoming comedy starring Zac Efron and Adam DeVine, is based on real guys named Mike and Dave who needed real wedding dates. So technically it should ultimately fall in the same Netflix bucket as The Theory of Everything, The Danish Girl, and the non-Eddie Redmayne-starring Steve Jobs — i.e., the biopic. “Yeah, it’s really an origin story,” Efron told Yahoo Movies at CinemaCon in Las Vegas, hours after Fox had premiered an extended clip, in which Kumail Nanjiani gives co-star Sugar Lyn Beard a “preposterously filthy naked massage” (as one outlet put it). There are conflicting reports about just how accurate the comedy is, depending on who you ask. The basic premise is fact-based: In 2013, bros Mike and Dave Stangle put an ad on Craigslist soliciting female companions for their sister’s wedding. “Rather than ask some fringe women in our lives to go and face the inevitable 'does this mean he wants to take it to the next level! ?’ questions, we’d rather bring complete strangers and just figure it out,” they wrote. That much is adapted into the movie version, which then heads to Hawaii for a series of very R-rated comic misadventures. “There’s fist-fights, there’s accidental fires, there are horses that are let loose, Ecstasy trips,” DeVine explained. “It goes crazy,” said Anna Kendrick, who along with Aubrey Plaza, is one of the out-of-control young women who accept Mike and Dave’s invitations. Efron, DeVine, and Kendrick say the film deviates from the true story once the action moves to paradise. But the Stangle brothers (strappingly tall men Kendrick calls “the f–king Winklevoss twins” from another biopic, The Social Network) may think otherwise… sometimes. "It’s crazy when you’re talking about a God-like being like Zac Efron..."
At last, a director reveals his honest opinion about one of his lead actors. I simply adore these three together. So much love. Very exciting stuff.